Just a girl with a hammer: It's always something. I'm prepping the basement for laminate flooring, which means Dryloking any cracks in the basement floor and moving everything out of that space. 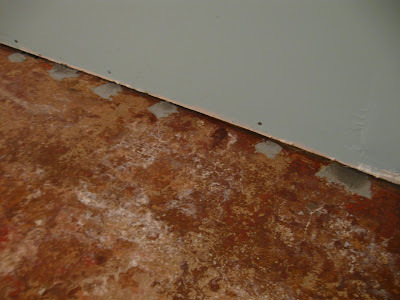 It also means a little bit more scraping in the alcove, where there was no vinyl tile laid down; there was just padding glued down on the cement slab. Good enough. I whipped up a container of Drylok (please please remember that Drano melts this stuff) and worked incredibly fast, filling the holes that were created by the carpet tack strips being nailed into the concrete. I missed a hole, can you tell where? I don't know how I did that. But a funny thing happened while I was trying to loosen little bits of vinyl tile from under the perimeter where the drywall made it difficult to scrape: I found crumbled bits of wood. Sort of like you'd see with termites. It's just in one spot and it could be dry rot. Or it could be termites. Termites in Oregon are subterranean, so it's totally plausible that they'd be in the basement. The wood gives when you poke it with a screwdriver. 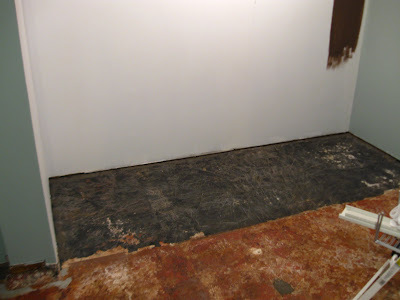 While I had my cheek pressed to the floor, peering into the half-inch clearance between the Drywall and the floor, I noticed that there was wood paneling underneath the drywall. Awesome. Why remove that when you can just add more layers on top? So I called my trusty exterminator dude and he's going to come out tomorrow to tell me what he thinks. I'm just hoping he doesn't tell me that we need to remove the drywall from that area. He's probably going to tell me we need to remove the drywall from that area. So it goes. Super awesome update: No sign of termites but the guy did a quick spray for me, behind the drywall, just in case any termites think about coming in for a snack. EcoTech NW is highly recommended, if you're local.